This is a story about someone who wants to stop. Alfie Monk is like any other nearly teenage boy except he’s 1,000 years old and can remember the last Viking invasion of England. So when everything Alfie knows and loves is destroyed in a fire, and the modern world comes crashing in, Alfie embarks on a mission to find friendship, acceptance, and a different way to live which means finding a way to make sure he will eventually die. The 1,000 Year Old Boy started life as a title, and not much more. The title popped into my head one night and in the morning it was still there. There is an old comedy sketch for radio by Mel Brooks called “The 2,000 Year Old Man,” which I had heard of but never listened to. Perhaps that was what triggered the thought? Anyway, for several weeks after I had decided to write it, I dithered over exactly how to approach this vast story. All writing is a series of decisions over what to include and what to leave out. Usually, the choices are limited to the timeline of the characters and action, plus whatever backstory is required for it to make sense. 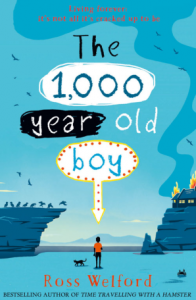 Alfie, though (the main character in The 1,000 Year Old Boy) has a thousand years of story, not to mention the story of how his extraordinary condition – agelessness – came about. It all made the book the hardest one I have written; it is also, however – in my opinion – the best. I am very proud of the finished story, and I cannot wait to share it with readers.